Santos Barbosa works in oils and acrylics and has specialized in Western art and cowboys for more than 40 years. Today, one of Barbosa’s paintings hangs in the lobby of the Tucson Museum of Art, which acquired it through a donation: “Tiempos Pasados, San Antonio”. David Vandenberg specializes in hyper realism. Growing up in a family filled with historical significance, he was immersed from a young age in the wonder of times gone by. His work demands an exhaustive study of historical and visual sources which the viewer can appreciate in every detail. Jane Hamilton Fine Art now representing Joe Cajero, Jr.
Joe Cajero, Jr. was born in 1970 in Santa Fe, New Mexico and raised in the Pueblo of Jemez. 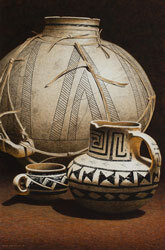 He is a descendant of a long line of Pueblo artists, including his father, a painter, and his mother, Esther, a potter. As a child, Cajero would often accompany her to Indian art shows throughout the Southwest. 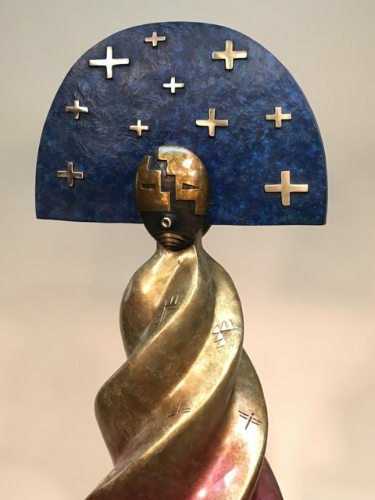 On the road as well as in her small shop in Old Town, Albuquerque, the young Cajero learned from his mother, the business of marketing ones art and was challenged to try a creative form he never guessed he’d be known for today, clay and bronze sculpture. While growing up, Cajero also had the privilege of spending many hours with his maternal great-grandmother Petra Romero, listening to the wonderful stories she would tell of times gone by. Her stories provided him with a solid foundation in his traditional culture and it continues to influence the work he does today. Cajero has been creating clay originals and limited edition bronze sculptures for more than 17 years now, including a few monumental commissions. He enjoys working with commercial clay and traditional Jemez clays, as well as, the process of selecting the patinas (colors), which are used in the finish of bronze sculptures. This has led to the opening of new creative doors for the artist. He is also creating a line of jewelry castings inspired by images taken from his bronze sculptures. He is excited about the creative possibilities that each medium has to offer. Jane Hamilton Fine Art, celebrating 27 years. Located at the sw corner of Skyline & Campbell in Plaza Colonial. Jane Hamilton Fine Art presents The Phillips Family Collection. We have received a fabulous collection of classic western art from the Phillips Family. Included are bronzes by Bill Nebecker and Buck Mc Cain and oils by Roy Anderson, Rock Newcomb and Ramon Kelley. Please stop by and feast your eyes on these great works. Tucson Artist Jack Eggman has passed away. He was 63 years old. Jack R. Eggman a Tucson native and artist, has left our earth this summer. 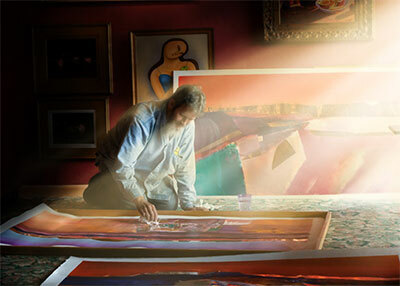 Jack had shown his work in my gallery since 1992 in Bisbee . He would drive down with Joyce, his Mom, with new work, have lunch, so Joyce could see her favorite, my then small son Joseph. Pima Community College . Jack told me when he got out of the army, he decided to use his GI Bill to study art because he liked to draw. He took their printmaking classes and used their presses, till they through him out! He generously supported the American Diabetes Association by donating his “Arizonascapes” to their big Gala . Jack Eggman will be honored along with other veterans this October MIAP through the American Legion Auxiliary in Oro Valley Unit #132. "Woodsilks & Tula” a fun trunk show weekend ! Dianna Cates Dunn who’s art captures the whimsical antics of muse “Tula” in her paintings will be featured, alongside Santa Fe artist Barbara Woods who's “Woodsilks” are inspired by the rich pallet of colors and designs found in creatures of nature. "Woodsilks” are lamps that are encased in ceramic bases, creating a beautiful accent art piece. Stop by to meet these two unique artists. “Woodsilks & Tula” trunk show Friday & Saturday from 11-4pm on March 15th & 16th. January 18th: Linda Ahearn & Kathleen Frank "Two Expressions"
February 15th: Peter Eisner & Brad Stroman "Art Fusion"
Jane Hamilton Fine Art is the exclusive location for Sticks in the Tucson area. Sticks was started by Sarah Grant in 1992. 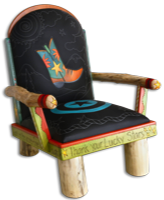 Since then, Sticks has received national acclaim for our distinctive line of furniture, accessories and object art. Each piece is handcrafted within Sticks’ award winning studio in Des Moines, Iowa. All pieces are finely crafted from birch, poplar and driftwood. The pieces are further designed with hand drawn imagery, etched contouring and vibrantly blended paint. Pieces can be embellished with 3-D wood components, metal, leather and fabric. The line is constantly evolving due to the imagination of the design team and the many talented craft artisans that they employ. Every piece that they produce can be personalized to feature themes, imagery or colors that you customers desire. Welcome to our award winning website. Google has started forcing a ‘Not Secure' warning, for non-HTTPS websites collecting sensitive information. It appears in the address bar and implies that the website is not secure or dangerous for users. The warning can easily confuse website users and make them interpret some security issues with the website. This is mainly intended as a protection for e-commerce sites that collect information. We do not collect passwords etc. so please ignore the "Not Secure" warning. Please disable ad blockers on this domain. There are no ads here. Ad blockers may adversely affect the correct functioning of this site. Be sure to have the most up to date web browser installed for the best viewing experience.